MOUNTAIN VIEW, Calif.--(BUSINESS WIRE)--Bidgely today introduced the new Bidgely Insights Engine that extends the value of its artificial intelligence platform to a range of internal utility functions. 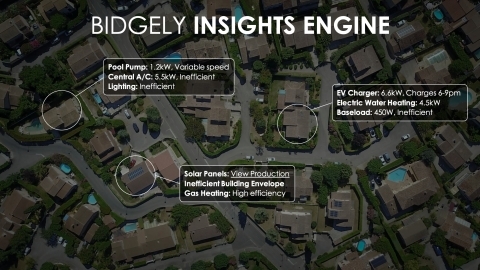 The Bidgely Insights Engine analyzes meter data from both smart and monthly read meters, plus a variety of third-party data including weather, demographics and building data, to identify and segment customers by appliance-level ownership, usage and efficiency. Stakeholders from executives and analysts to program managers and program implementers can utilize this new business intelligence tool to optimize utility programs with targeted, personalized customer outreach and enhance grid modernization efforts like load forecasting and scenario planning for distributed energy resources (DERs). DSM Planning and Program Optimization: Perform scenario analysis across all DSM programs to achieve highest adoption and lowest cost, such as how much to invest in pool pump rebate programs vs. an A/C tune-up program for a given population. Find and target homes with large and inefficient appliances that would offer the most savings per rebate, in addition to which appliances run at peak hours for Demand Response, optimizing program spend to achieve savings goals. Rate planning: Understand the impact of introducing various rates on customers’ bills. Includes solar disaggregation that can identify how much energy a home produces and consumes hour-by-hour without sub-metering, savings millions of dollars. Electrification Analysis: Find homes that have Electric Vehicles with L2 or L3 chargers and determine how often they charge during peak and off-peak periods, helping to inform EV planning and encourage customers to sign up for EV Time-of-Use rates. For more information about the Bidgely Insights Engine, visit: go.bidgely.com/Insights-Engine.